Hotel-style John Muir Lodge, in the Grant Grove portion of the park. : Woodsy 21-room hotel is well located for exploring the park’s canyon. Open late Apr–mid-Oct; from $119; 877/436-9615. : Some cabins with baths, some without—tent cabins too. Cabins: from $129 May–Sep, from $129 Oct–Apr; tent cabins: from $79 Jun–Aug; 877/436-9615. : Pleasant, modern lodge in Grant Grove. From $200 May–Sep, from $99 Oct–Apr; 877/436-9615. : Venerable (more than 75 years old) rustic camp is reached by a moderate 11.5-mile hike on the High Sierra Trail. Once you arrive, you’re rewarded with comfortable tent cabins, good camp food (breakfast and family-style dinner), and magnificent views of the Great Western Divide. Open Jun–Sep; from $350 per day for 2 people, including 2 meals; 866/807-3598. : Stylishly rustic, this 102-room lodge near Giant Forest is probably the nicest place to stay in the park—and its restaurant ($$$) the best place to eat. From $215 mid-Apr–Oct, from $130 Nov–mid-Apr; 866/807-3598. 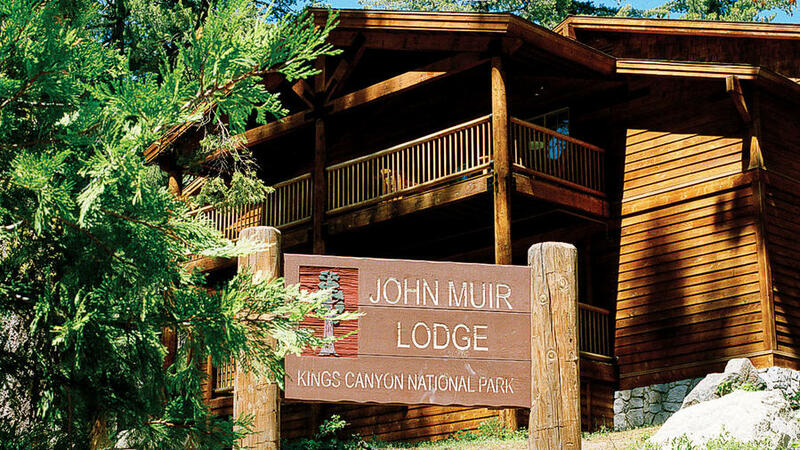 : Long-established resort in Sequoia National Forest, between the parks; offers cross-country skiing, snowshoeing, and snowboarding in the winter and is a good base for hiking and exploration at family camp in the summer. Mid-Sep–mid-Jun from $119 for 2 people, some meals included; mid-Jun–Aug family camp from $4,195 for 6 nights for 4 people, including meals and activities; 800/227-9900. .
: Luxury in the wilderness: 30 tent cabins (with comfortable beds) reached by an easy 0.75-mile hike from the parking lot- or a challenging 12-mile hike through scenic wilderness. And the food (3 meals a day are served) is very good. Open mid-Jun–early Oct; $300 per person per day, including 3 meals; 866/654-2877. .
: Your best non-camping option near Mineral King (about 4 miles before the end of the road), Silver City has newish chalets and older cabins. Open late May–mid-Oct; from $100; 2-night minimum stay; 559/561-3223. : Handsome 12-room hotel in adjacent Giant Sequoia National Monument. Open May–early Oct; from $209, including continental breakfast; 559/565-3909. There are 7 developed campgrounds within Sequoia and 7 within Kings Canyon, all operated by the National Park Service, and most are first come, first served. Lodgepole and Dorst Creek campgrounds, near Giant Forest, accept reservations ( or 877/444-6777). The Foothills campgrounds lie near Sequoia’s southern entrance and two campgrounds are near Mineral King. Situated at 7,200 feet Quaking Aspen Campground puts visitors near some of the best views in the park at Needles Lookout, Dome Rock, and Mule Peak. This minimalist, reservation-friendly campground hosts 32 single-family sites, as well as spacious group lots fitting anywhere from 12 to 50 people. Made for relatively seasoned campers, Quaking Aspen forgoes sinks, showers, and even running water during the drought. Expect pit toilets and bring plenty of water, or stock up at the general store just two miles away. Due to the infrequent bear activity not all sites contain bear bins. Accepts reservations; $24/night; open mid-May to mid-Oct weather-permitting; . At Kings Canyon, you’ll find campgrounds clustering at Grant Grove and at Cedar Grove. The per-night, per-site camping fee is the same for RVs, trailers, and cars. No RVs or trailers are allowed at the two campgrounds in the Mineral King area. Buckeye Flat 28 sites; open mid-Apr–Sep; $22. Potwisha 42 sites; open year-round; $22. South Fork 10 sites; open year-round; $12. Dorst Creek 210 sites; open late Jun–early Sep (reservations: or 877/444-6777); $22. Lodgepole 214 sites; open April–Nov (reservations strongly recommended: or 877/444-6777), $22. Atwell Mill 21 sites; open late May–Oct; $12. Cold Springs 40 sites; open late May–Oct; $12. Canyon View 16 sites; open late May–early Sep; $40. Moraine 120 sites; open mid-May–early Sep; $18. Sentinel 82 sites; open late Apr–early Nov; $18. Sheep Creek 111 sites; open late May–late Sep; $18. Azalea 110 sites; open year-round; $18. Crystal Springs 36 sites; open late May–early Sep; $18. Pulaukotok 155 sites; open late May–early Sep; $22.